It’s not overhyped. This is probably the best designed hostel that I’ve ever been to. Each dorm bed has its own refrigerator space and each bed has its own rack, fan, electricity plug, and bed light. The staff and owner are very helpful. The only thing I would recommend is that there is info on how to get to metro centro but no information on how to get back to the hostel from metro centro. Hemos tenido una hermosa estadía en Casa Verde! 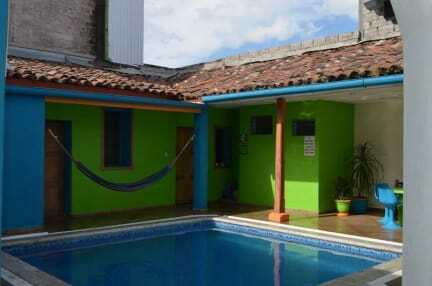 Un cuarto espacioso, una cocina impecable, la posibilidad permanente de realizarte tu propio café, una linda piscina y un personal atento y amable en todo momento. 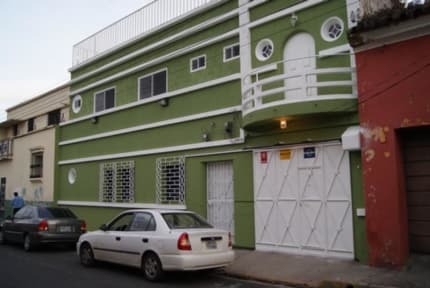 El hostel brinda información sobre recorridos y trayectos a realizar en El Salvador, así como también diferentes paseos. Lo recomendamos totalmente! Gracias a los amigos y amigas de Casa VERDE! Hermosa estadía! Que viva El Salavador! personal muy amable, el hostal muy comodo y hay una alberca!!! Amazing place. It has everything! Loved this place and ended up extending purely for the hostel. The room I stayed in (room 3) had an amazing shower and bathroom, a big tv and a supremely comfortable double bed (plus another single). The kitchen is equipped with absolutely everything you could need and it's so clean you want to spend time in there. The staff are great, I've met both Alex and Carlos and they're very friendly and can speak enough English. Fully recommend Casa Verde. Hostel bien pensado en todo aspecto y con personal muy amable. Volvería sin dudarlo.